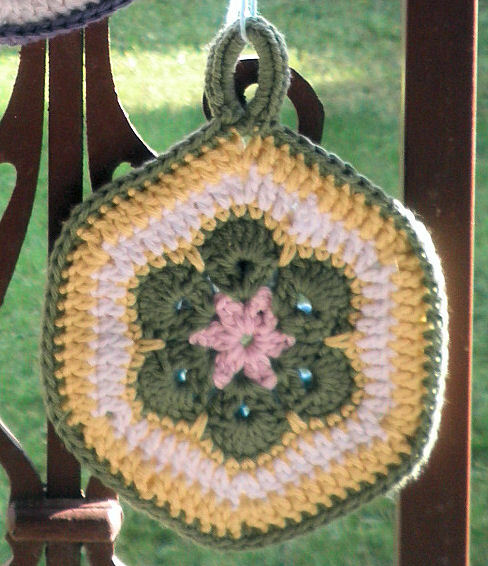 A potholder is an excellent way to use a couple of African Flower motifs and they work up quickly and make excellent housewarming gifts. Use matching and contrasting colors to give them interest. It’s also a good way to use up smaller lengths of yarn. Whatever yarn you use, make the potholder with a smaller than recommended size hook so that the sts are more dense. Otherwise, there will be large spaces that may allow fingers to touch the hot object and get burned. Yarn Content Make sure to choose a yarn that will not melt when in contact with hot objects. 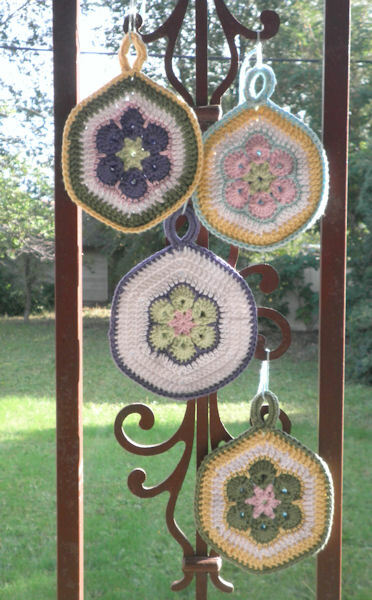 Rounds 1-4 With A, B, and C, make two African Flower motifs with the same yarn color as the outer color, i.e., round 4 is purple for both motifs. With D, join with sl st in first sc after any spike st, ch 3, dc in next two sc, *(dc, ch 1, dc) in next sc (middle/apex st of ea petal), dc in next three sc, dc in spike st, dc in next three dc,* rep from * to * around to last spike st, join with sl st in to top of beg dc. Note: If you start at the opposite side of where round 4 ended, you can work in the ends as you go. Work in the beg end of D then, when you get to where round 4 ended, work over the beg and ending ends of round 4. Ch 3, dc in next 3 dc, *(dc, ch 1, dc) in next ch-1 sp, dc in next 9 dc,* rep from * to * around to last ch-1 sp, dc in next 5 dc, join with sl st in top of beg dc. Note: You can continue to use D for this round or change colors if you’d like to. Round 7 Rep round 6. Add additional rounds as needed to get the size and colors you want. Fasten off and weave in all ends. Hold motifs with wrong sides together, join C with sc in any ch-1 sp (insert hk through both motifs), ch 10, join with sc in same ch-1 sp, 34 sc in ring (keep pushing sts back so they fit, sc in ch-1 sp again, sc in ea dc and ch-1 sp around of both potholders to join them together, join with sl st to first sc. Fasten off with a long tail. Note: Ring can also be made by crocheting sc around a plastic ring, then joining it to a ch-1 sp of the motifs before continuing with the joining scs around the motifs. With yarn needle, pull yarn through one of the sc at the bottom of the ring to help flatten out the ring. Run yarn through bottom of ring and rep on other side of ring. Weave in any remaining ends.